Old Town Cottage has been fully and tastefully refurbished to the highest standard with an eclectic mix of British and Turkish fixtures and fittings with comfort and romance in mind. It sports an en suit bedroom, a Hamam relaxing area, large balcony for breakfasting and a sun deck and al fresco dining area on the roofoverlooking the Harbour and Kalkan Bay. Quiet but very close to all amenities.!!! Any day changeover! I am the proud Mother of five young professionals, a wife to my Property Consultant husband of countless years and owner of a menagerie of pets who have a "live in nanny" for when I am away. I have a passion for all things, "old" and many things new with a never ending interest in architecture and design both in house and garden. I am an artist, Interiour designer, writer and chefey connoisseur of all things fresh and good which makes Kalkan and its local produce extremely attractive to me. I love the people of Kalkan and have many local friends who I love to see and spend time with whenever I am in Kalkan. My aim is to provide a wonderful home from home for discerning guests and I hope Honeymooners in particular. There is a definite shortage of good, well thought out properties for couples and I hope to help fill that gap. The Cottage could sleep four and will be fully equipped for this possibility but I would prefer to let it to couples and will price it with this in mind. Old Town Cottage is the sort of, "little gem" that is impossible to miss. I have owned and let Villa Simzer since falling in love with Kalkan some six years ago. I walk through Old Town a lot, just looking at the beauty of the narrow cobbled streets and I have always wanted to own my own little piece of Paradise. Luckily, my girlfriend and local Kalkan Lawyer, Kader Gunes was told of the possibility of one of the little Cottages in the very best, favourite, cobbled street and was able to snap it up before word got out. It must have been meant as I knew, it was almost impossible to find anyone willing to sell anything in that part of Old Town. Since buying it, I have worked with the local craftsmen to fully renovate and "deck out" my Cottage to the highest standard but retaining as much of its original features as possible. There are many restrictions on the preservation of Old Town which must be respected of course. Just getting permission to change the internal aspects meant many appeals to and visits from officials in Antalia and even getting water and electricity put in required an elaborate project submission which took Months before a satisfactory conclusion was met. Well worth it though! A short stroll to the beach, harbour, restaurants, shops and bars. The peace and quiet with the sound of little boats chugging into the harbour. 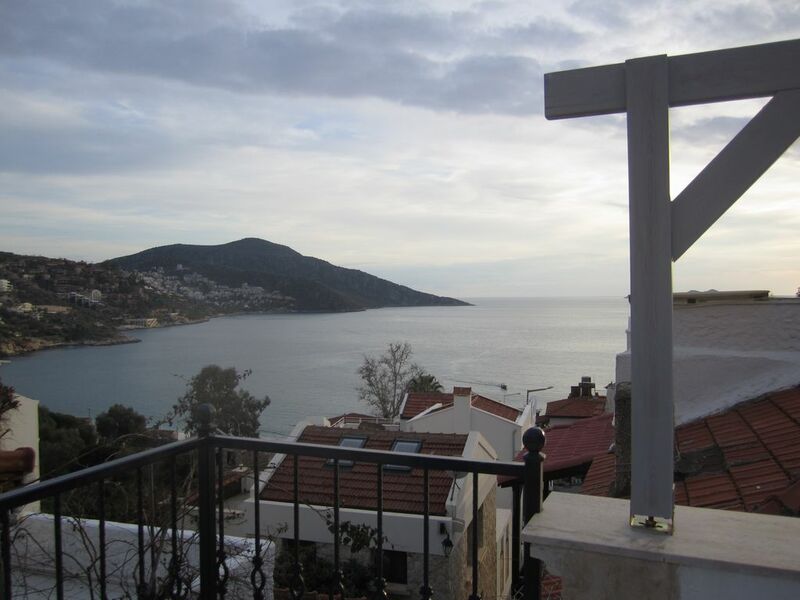 The view of the beautiful Kalkan Bay from the Street, the balcony and the sun deck. Good Management is essential in case of queries or problems of any nature. I run a, "use andreplace" system for cupboard basics as I find it very annoying when I have to shop before I can sprinkle a bit of salt on a salad leaf or rinse a dish etc. All my guests need to do is book flights and I can arrange and advise on anything else. If, I don't know something, I will know someone who does. I am contactable almost any time as are my Management team in Kalkan. I am hoping for couples to form a returning list of valued guests over time. I would like to see a few honeymooners. The Cottage can sleep four in two double beds but I would prefer to let to just one couple so, I will charge extra for any more than two guests. I am after perfection with romance in mind. Kalkan, Old Town is totally magical! Wifi/internet is available everywhere in Kalkan. I just buy a coffee close to the Cottage and job done. I am in the queue to get it officially put on but "next week" can mean anything in Turkey and it is rare I can't get a share. One full wet room bathroom with loo, shower, hand basin and storage. Travatine, marble Tyler's throughout. Fresh! Turkcell, local cards are easily available for very little. I rely a lot on mail, texts and the free lines of WhatsApp, Face time etc. Yes, usually, the best, John Lewes or Lulu Guiness can provide. I probably won't instal these as my maid deals with such things- off site! Yes, parking in most side streets. Yes, it is everywhere in Kalkan and I have resedency so, it should be there along with cable. Yes! Again, the best and fluffiest possibly. I fly them out which a tad like, "tea to China" but I just do that! I hope not to add this as I enjoy beautiful, old dishes and plates and I have a maid! I decided to opt for a fancy bespoke barbie and huge fridge freezer. Room for salads and cold drinks a must! All the basics and more on a use and replace bassist. Much like home! Aimed at supporting outside dining! Either Al Fresco on the sun roof or on the enclosed balcony..... I can provide things for a baby if returning honeymooners might need them before moving onto Villa Simzer, ha! Yes, I am installing a "smart TV! I need to consult my children to set this up! Not a lot if any! An enclosed balcony with fully opening windows on first floor and large sundeck on the second. Sun deck and shaded area. En suite bedroom on ground floor but no easy access to any further accommodation. Old Town Cottage might not be for everyone, but it was perfect for us. Superbly located in the Old Town, beautiful views from the roof terrace, very high quality fixtures and fittings, quirky. We called it our Kalkan Beach Hut. Very comfortable, but small. If you love the real Kalkan this is for you. Two people max in my opinion. The Cottage is in a cobbled Street leading down to the beach and harbour where the day boats are docked, going out every morning, serving delicious lunches at amazing prices and stopping in quiet coves for guests to swim or take mineral, mud baths. All the best Restaurants are within easy strolling distance, just far enough away not to disturb ones peace. The sound of the sea and little boats chugging in to dock is a joy. The shops are also close by and sell everything one might wish for. The cobbled streets of Old Town, Kalkan are a delight to stroll through with bourgenvia in flaring bursts of bloom everywhere. It is easy to book trips off and about to see the Roman Ruins, Patara Beach, well, just about anything to amuse really. There is a diving school organising trips from the harbour, canoeing, waterfalls, quad biking, etc. There are also good beach clubs and evening events with buffets or romantic boat trips. I send out updated advice sheets to all my guests. The rates listed are for two persons sharing and listed at the minimum, "quieter season". Each booking will be dealt with case by case and a fair price for both sides arranged. I do not want to encourage young children as I do not think this property is very well suited. My family villa is perfect for children but not the smaller Town House. Villa Simzer is in fact the ideal family property with the Town House suiting mainly couples.